Our Kaprice frame is made from FSC certified, USA Sycamore wood. Ideal for residential or entry level commercial purposes and for the eco-conscious requiring sustainability of wood resources Materials: wood, olefin. Colours Available: black, natural, reflex blue, red. Decoration Options: Screen print, digital print. Decoration Areas: 420x280mm. All Blacks childrens supporter umbrella. Black and clear EVA material with All Blacks print on all 8 panels. Steel construction with rounded tips for safety. Product Materials: steel shaft and ribs | plastic hook handle. Decoration Options: Not allowed to be printed on. Decoration Area: Nil. 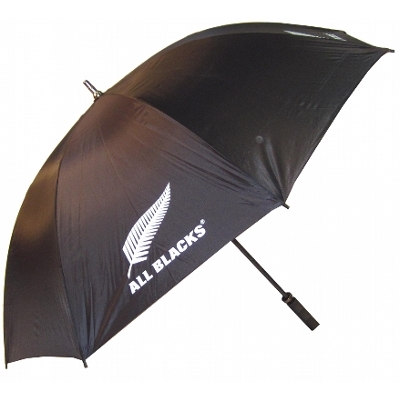 All Blacks adults supporter umbrella. 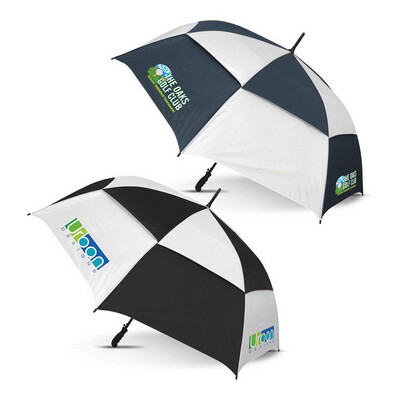 Fibreglass frame with moulded rubber handle, the perfect umbrella to take to the games Materials: fibreglass, nylon. Size: 75cm panel length, 132cm diameter. Colours Available: black. Decoration Options: Not suitable for print. Decoration Areas: N/A. 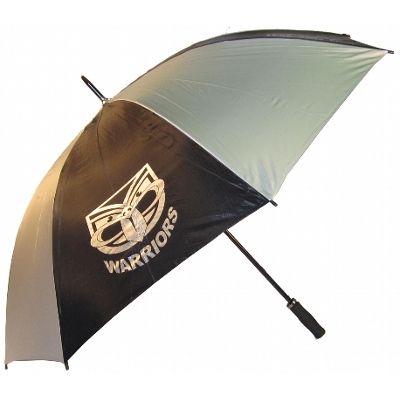 NRL Warriors supporter golf umbrella. Strong construction with Warriors brand, perfect for game day. Has 50+ UPF protection. Great for the sun and rain. A must for any supporter Materials: steel, fibreglass, nylon. Size: 75cm panel length, 132cm diameter. Colours Available: black/silver. Decoration Options: Not suitable for print. Decoration Areas: N/A. High quality folder with textured handle. Realistic rain drops on the handle gives this umbrella a stunning look. A perfect unisex folder with a difference Materials: steel, fibreglass, nylon. Size: 53cm panel length, 97cm diameter. Colours Available: black, cyan, navy, purple. Decoration Options: Screen print, digital print. Decoration Areas: 200x100mm. Unique three fold 54 cm, eight panel folding umbrella featuring both auto opening and auto closing. Has a high quality 190T pongee showerproof canopy with matching carry sleeve and folds down to a very compact 28 cm when not in use. The eight rib frame is constructed from metal with fibreglass added to ensure it is flexible and windproof. Other features include a three stage expanding metal shaft with plastic and leather look hand grip, metal tips, a velcro tie and hand strap. Colours: Black. Dimension: Dia 950mm x L 545mm (open). Print Description: 160mm x 120mm (one colour). Print Type: Screen Print. Packing: Loose packed. Double fold 52 cm, eight panel umbrella with auto opening. Has a strong 190T showerproof canopy which folds down to a compact 38 cm in length when not in use. The eight rib frame is constructed from metal with a two stage metal shaft. Other features include a 190T slide on carry sleeve, plastic and leather look hand grip, metal tips, a velcro tie and hand strap. Colours: Yellow, Orange, Red, Bright Green, Light Blue, Royal Blue, Black. Dimension: Dia 940mm x L 510mm (open). Dia 45mm x L 385mm (closed excluding wrist strap). Print Description: 160mm x 120mm (one colour). Print Type: Screen Print. Packing: Loose packed. 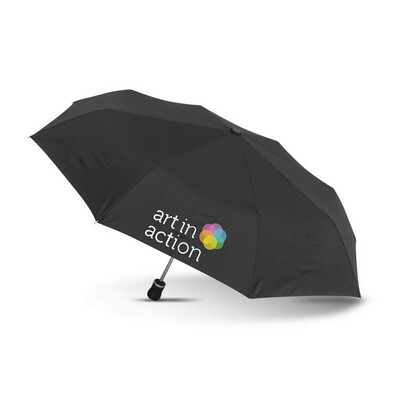 Our biggest selling umbrella. Full aluminium frame with marine style cleat pulley system. Lightweight and extra strong. The most suitable for outdoor use in bars and cafes or if you are close to the sea Materials: aluminium, olefin. Colours Available: black, natural, reflex blue, red. Decoration Options: Screen print, digital print. Decoration Areas: 420x280mm. Cantilever in ground base. Concrete into the ground for permanent installation Materials: steel. Colours Available: grey. Decoration Options: Not suitable for print. Decoration Areas: N/A. 25kg Concrete Base. Painted black, with screw to secure umbrella. Product Materials: Concrete. Colours: Black. Our latest addition to the Hurricane family. If you want a quality umbrella that will last, then this is it. Aluminium shaft that won't rust and lightweight with auto open. Full fibreglass windproof rib structure with vented canopy to survive the strongest of winds. New stylish rubberised handle with comfortable grip. Sleeve comes with a handy carry strap. 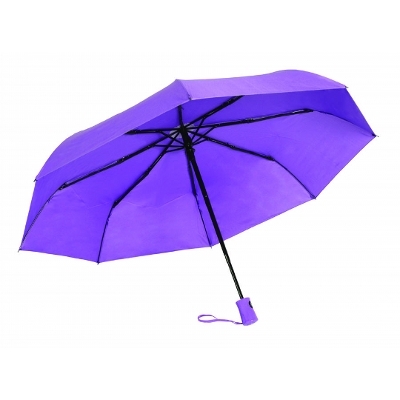 The perfect umbrella for any situation Materials: aluminium, fibreglass, nylon. Size: 72cm panel length, 126cm diameter. Colours Available: black, cyan, fushia, navy. Decoration Options: Screen print, digital print. Decoration Areas: 260x195mm. The best folding umbrella on the market. 3 section frame to make it compact for glove box or hand bag. The latest designed full fibreglass windproof frame with vented canopy. Auto open and close operation with safety close feature that makes it easy to use. 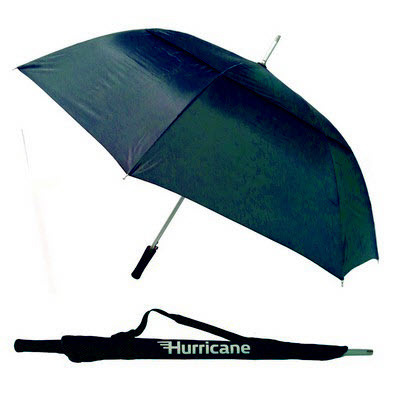 Hurricane brand on the handle so you know you can trust it Materials: steel, fibreglass, nylon. Size: 57cm panel length, 100cm diameter. Colours Available: black, black/cyan, black/red, navy. Decoration Options: Screen print, digital print. Decoration Areas: 200x100mm. Affordable hand opening 76 cm, eight panel sports umbrella with a strong 190T showerproof canopy. Has an eight rib metal frame and shaft complete with a soft EVA hand grip. Other features include a metal closure ring, plastic tips, a velcro tie and the option of full colour printing on the models with white panels. Colours: White/Orange, White/Red, White/Bright Green, White/Blue, White/Black, Black. Dimension: Dia 1300mm x L 1005mm (open). Print Description: 250mm x 150mm (one colour). Print Type: Screen Print. Packing: Loose packed. Very affordable 59cm, eight panel auto open umbrella with a tough 190T showerproof canopy. Has a Black eight rib metal frame and shaft complete with a soft EVA hand grip. 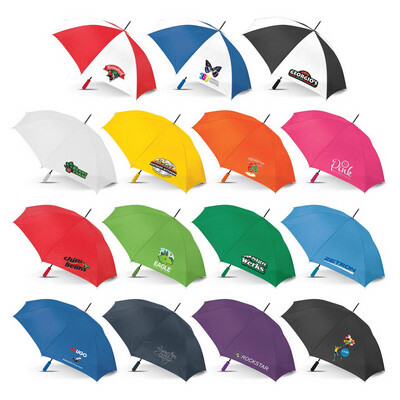 Other features include metal tips, a Velcro tie and the option of full colour printing on the models with White panels. Colours: White/Red, White/Dark Blue, White/Black, White, Yellow, Orange, Pink, Red, Bright Green, Dark Green, Light Blue, Dark Blue, Navy, Purple, Black. Dimension: Dia 1055mm x L 825mm (open). Print Description: 180mm x 130mm (one colour). Print Type: Screen Print. Packing: Loose packed. Unique double fold 71cm, eight panel umbrella with auto opening. Has a strong 190T showerproof canopy which folds down to 55 cm in length when not in use. The eight rib frame is constructed from metal with fibreglass added to ensure it is flexible and windproof. Other features include a two stage expanding metal shaft with matt plastic hand grip, 190T slide on carry sleeve, plastic tips, a velcro tie and hand strap. Colours: White/Black, Yellow/Black, Orange/Black, Red/Black, Bright Green/Black, Light Blue/Black, Royal Blue/Black, Black. Dimension: Dia 1250mm x L 800mm (open). Print Description: 250mm x 150mm (one colour). Print Type: Screen Print. Packing: Loose packed. 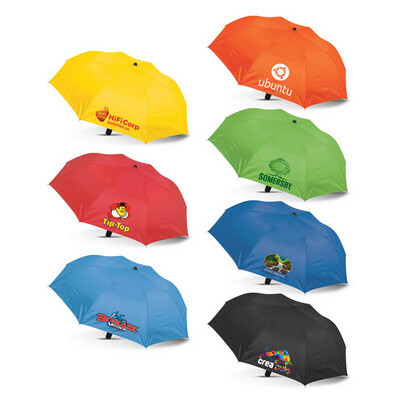 Auto open 76cm, eight panel sports umbrella manufactured from rugged 190T showerproof fabric. Has a fully vented double panel wind proof canopy complete with eight fibreglass ribs and a super strong fibreglass shaft. Other features include a contoured, soft touch rubber lacquered grip plastic tips and double velcro ties. Colours: Navy, Black. Dimension: Dia 1300mm x 1010mm (open). Print Description: 250mm x 200mm (one colour). Print Type: Screen Print. Packing: Loose packed. 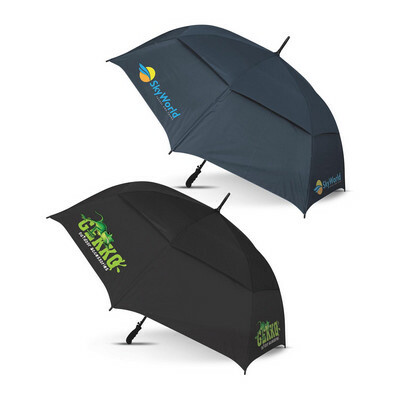 Totally unique, inverted 59cm umbrella with a double canopy which is manufactured from high quality 190T showerproof pongee material. It features flexible fibreglass ribs which wind proofs the canopy along with a strong metal shaft and it will conveniently stand upright on its plastic tips when not in use. This is the umbrella of the future with a revolutionary new design which enables the wet canopy to close inwards leaving a dry, non drip outer layer. Skyro will open or close "inside out" through a building or car door while the user remains dry inside. Colours: Black. Dimension: Dia 1018mm x L 830mm (open). Print Description: 230mm x 160mm(one colour). Print Type: Screen Print . Packing: Loose packed. 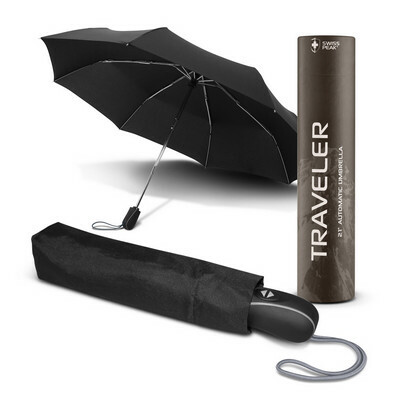 Stay dry with this compact three stage Swiss Peak umbrella which features automatic opening and closing and is thoughtfully presented in a printed gift tube. It has a wind proof 53cm pongee canopy along with a chromed aluminium shaft, fibreglass ribs and a carry pouch. Colours: Black. Dimension: Dia 990mm x L 565mm (extended). Print Description: 200mm x 140mm (one colour). Print Type: Screen Print. Packing: Gift box. 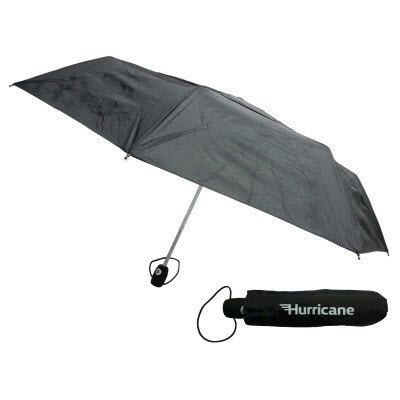 Premium 58cm dual layered pongee storm umbrella with automatic opening which is presented in a Swiss Peak gift tube. 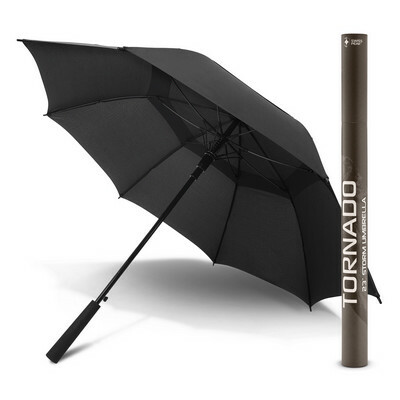 Tornado has a robust metal shaft with a fibreglass frame and a soft touch rubber lacquered handle. Colours: Black. Dimension: Dia 1055mm x L 815mm. Print Description: 180mm x 120mm (one colour). Print Type: Screen Print. Packing: Gift box. Superior 76cm auto opening umbrella with an eight panel canopy which is manufactured from rugged 190T shower proof fabric. Has a fully vented double panel wind proof canopy complete with eight fibreglass ribs and a super strong fibreglass shaft. Other features include a contoured, soft touch rubber lacquered grip, plastic tips and double velcro ties. Colours: White/Navy, White/Black. Dimension: Dia 1300mm x 1010mm (open). Print Description: 250mm x 200mm (one colour). Print Type: Screen Print. Packing: Loose packed. 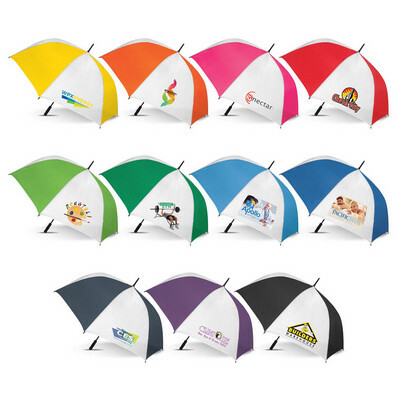 Auto open 76 cm, eight panel sports umbrella manufactured from rugged 190T showerproof fabric. Has a fully vented double panel wind proof canopy complete with eight fibreglass ribs and a super strong fibreglass shaft. Other features include a contoured, soft touch rubber lacquered grip, plastic tips, double velcro ties and the option of full colour printing on the white panels. Colours: White/Yellow, White/Orange, White/Pink, White/Red, White/Bright Green, White/Dark Green, White/Light Blue, White/ Royal Blue, White/Navy, White/Purple, White/Black. Dimension: Dia 1300mm x L 1010mm (open). Print Description: 250mm x 200mm (one colour). Print Type: Screen Print. Packing: Loose packed. 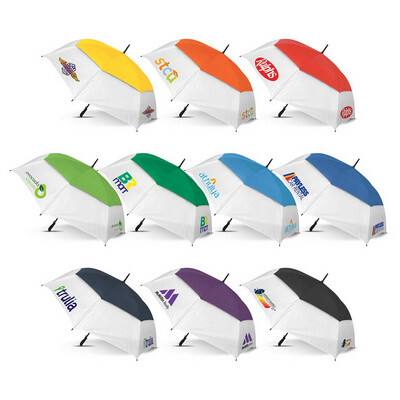 Premium auto opening 76 cm, eight panel sports umbrella with a strong 190T showerproof canopy. Has a windproof eight rib fibreglass frame and fibreglass shaft complete with a soft EVA hand grip. Other features include plastic tips, a velcro tie and the option of full colour printing on the models with white panels. Colours: White/Yellow, White/Orange, White/Pink, White/Red, White/Bright Green, White/Dark Green, White/Light Blue, White/Royal Blue, White/Navy, White/Purple, White/Black. Dimension: Dia 1300mm x L 1025mm (open). Print Description: 250mm x 150mm (one colour). Print Type: Screen Print. Packing: Loose packed. If you want quality and looks then this is it. Aluminium frame that won't rust, fibreglass ribs for extra strength, tilt feature, and top quality fittings. Comes with carry bag. The perfect gift for those hard to buy for Materials: aluminium, jetcloth. Colours Available: 12 colours available. Decoration Options: Screen print, digital print. Decoration Areas: 280x195mm. Our Kaprice frame is made from FSC certified, USA Sycamore wood. Ideal for residential or entry level commercial purposes and for the eco-conscious requiring sustainability of wood resources Materials: wood, acrylic. Colours Available: 60+ colours available. Decoration Options: Screen print, digital print. Decoration Areas: 420x280mm. Materials: acrylic. Colours Available: 60+ colours available. Decoration Options: Not suitable for print. Decoration Areas: N/A. Materials: polyester. Colours Available: charcoal. Decoration Options: Not suitable for print. Decoration Areas: N/A. Looking for a shade sail but scared away by the cost? Consider our Butterfly Gazebo - looks and functions like a shade sail but easy to install and without the expense. A solid structure that can be taken down when you leave. It's perfect for any large outdoor area, looks stunning, and is shaped so that the rain runs off. Powder coated steel frame, bungy cords to attach the cover to the frame for flexibility in the wind and easy take down if a storm's brewing. (Side walls available as an optional extra) Materials: steel, polyester. Colours Available: natural. Decoration Options: Not suitable for print. Decoration Areas: N/A.